The fur muff is one of the easiest accessories to make. 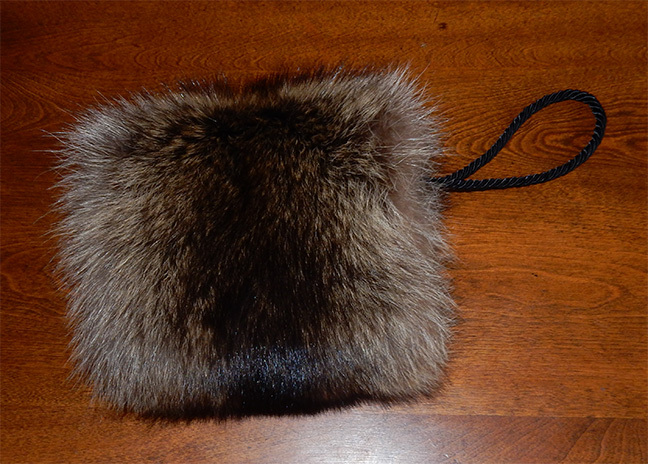 The example here is made from one raccoon pelt, which was not very large. 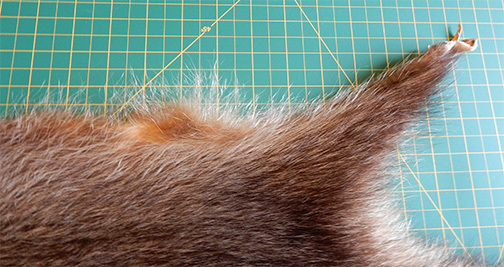 As with all fur sewing, one is meant to stretch the pelt before cutting it. This garment tanned small raccoon had no holes that needed to be fixed. It is stretched with tacks instead of staples, although professional furriers would typically use many staples for this process. The little aerosol bottle contains water. The pelt is moistened and stretched. It is left to dry for about 24 hours. The fur on this pelt is quite nice. However, there is a bald spot on one side near the rear leg. If that was the only bald spot, one could try to replace it. But the fur on that side is quite thin, so I chose to remove that edge. Using a straightedge and felt marker, the maximum rectangular piece possible was marked on the leather side of the pelt. 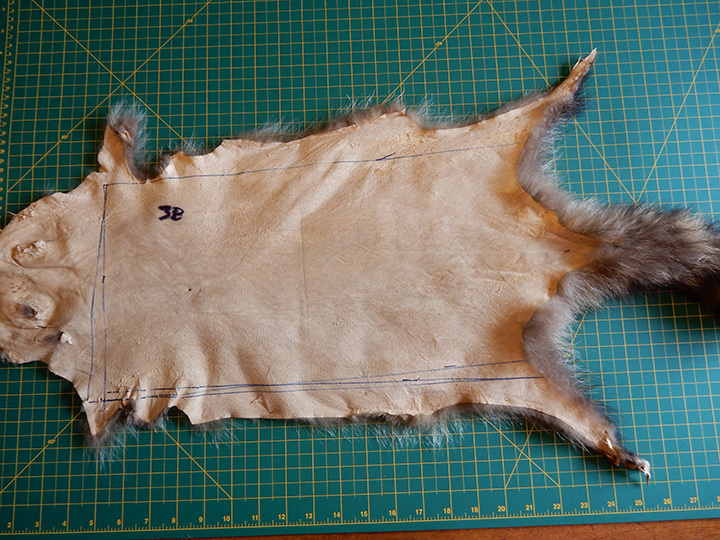 Using a furrier knife, single edge razor blade or scalpel, the rectangle is cut from the pelt. 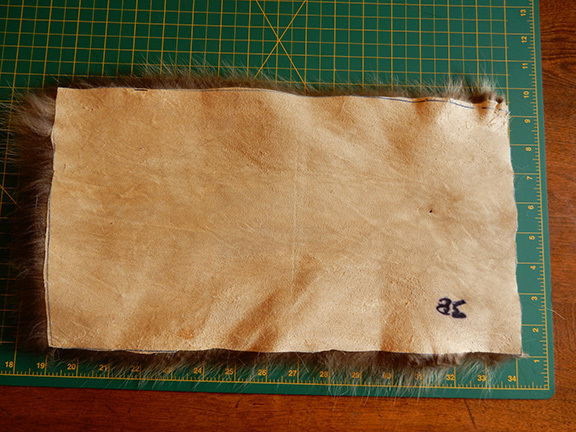 Be sure to cut from the leather side, holding the pelt up to avoid cutting any of the fur. 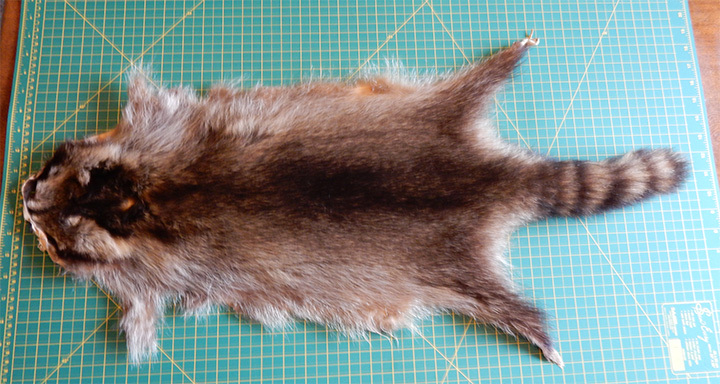 The rectangle from this raccoon pelt is only 9 inches wide. This is about the minimum width one would want for a muff. It would be a very appropriate size for a child's muff, but 12 inches is more typical for a ladies muff. The length was 15 inches. Many muffs are 19-23 inches long. Many vintage muffs are lined with satin. If you choose a lining fabric of that type, then the muff should be interlined with batting, either polyester or cotton. Polyester would be lighter and provide more fluff to the fur but if you are trying to be more historically correct, then cotton could be used. I chose a wool lining that is made for mitt lining for warmth. This fabric is fuzzy on both sides and has a soft base. Therefore this single fabric will provide both warmth to cold hands, and loft to the fur. Fleece would be another fabric one might use. The lining should be cut about an inch narrower than the fur, and about an inch longer. Sewing the lining to the fur on both long sides. Use either a fur sewing machine, which I did, or sew by hand using a glover's needle and quilting thread. Turn the fur to the right side. 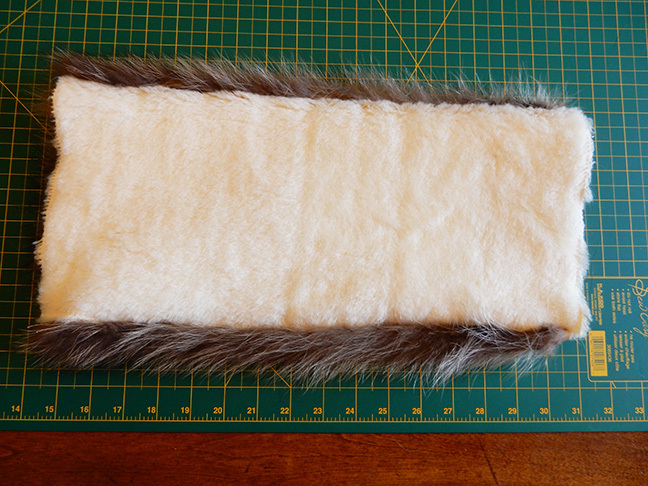 Note that because the lining is a bit narrower, the fur naturally turns over a bit at the edges, as desired. Next, sew the two ends of the fur together. Often a cord is attached to the muff. The cord can be long enough to go over the neck. In that case, attach one end of the cord to the inside of the lining on each side, before the two lining ends are hand-stitched together. Alternatively, use a shorter cord to go over the hand and attach both ends of cord to one side of the lining, as shown in this photograph. As you can see on the finished muff, the cream wool lining does not show from the front of the muff because the fur curls in at each end. The natural darker middle "stripe" on the raccoon falls in the center of the muff. If you don't have access to garment tanned fur pelts, leather stores often carry rabbit fur in "plates". These plates are like yardage, but made of several fur pelts, matched and sewn together. The muff at the right was made from such a rabbit fur plate, gifted to me by a friend. I lined it with fleece and interlined it with batting. It is 12 inches wide and about 23 inches in circumference. 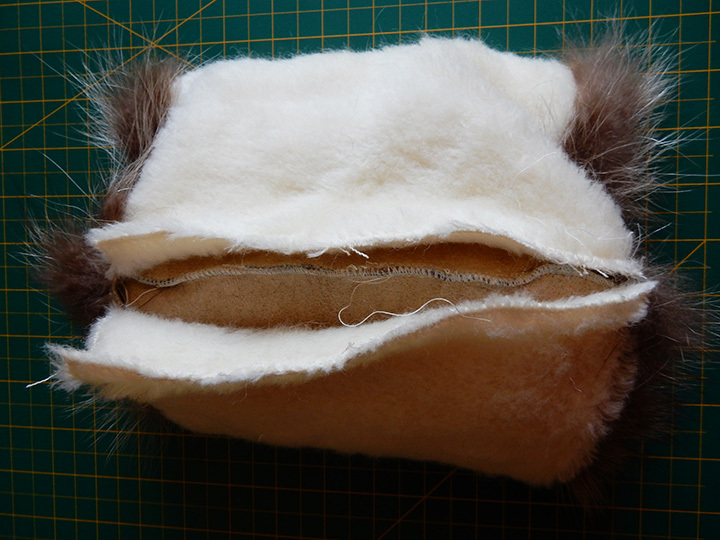 Making an 18th century fur muff – the actual sewing. by the Dreamstress, Leimomi Oakes. May 2, 2013. She uses the sleeve of an old fur coat and hand quilts a white satin lining to the batt underlining. DIY Fur Muff/Handwarmer. by "Jasmine", on her "Posing in Vintage" blog. January 11, 2013. 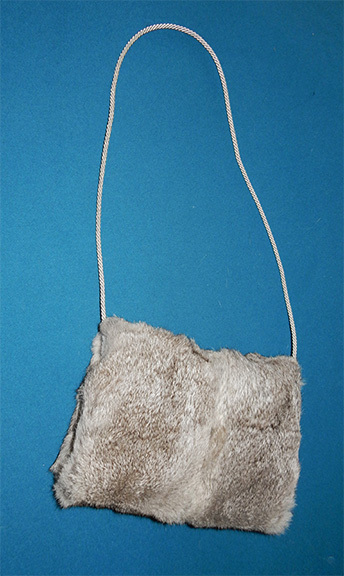 The muff is made from the sleeves of a vintage fur coat, with minimal sewing. 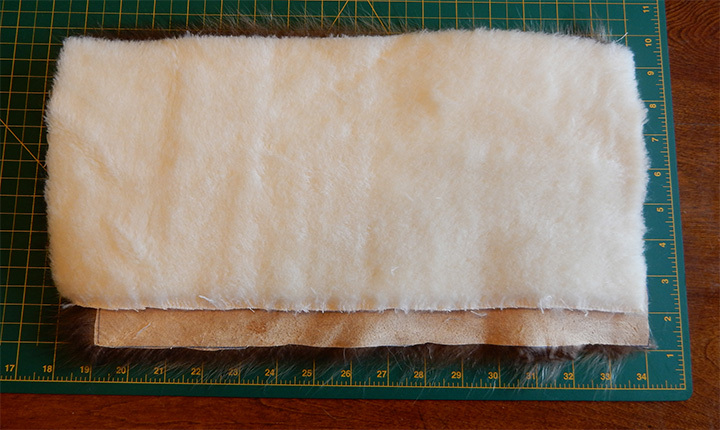 One sleeve piece is under for the outer fur of the muff and the other is used for the fur lining. A Brief History of the Fur Muff. by Stephanie Lehmann. (no date). The use of fur muff apparently began in the 1400s. Its size and popularity varied since then.